K-Mobile Banking is a high-security mobile banking service from KASIKORNBANK PCL. It is a comprehensive 24-hour full function e-banking service that allows you to do balance and credit card inquiry, bill payment, mobile top-up, funds transfer-both within KBank and online interbank funds transfer,push bill alerts, and free weekly mobile magazine. Registration at ATM is required for authorizing your savings/checking account for use with this service. Triple Lock Security ensures that access is possible only from your phone using your mobile number with your secret PIN. Mobile operators supported: AIS, dtac, TrueMove and TrueMove-H - both prepaid & postpaid services. 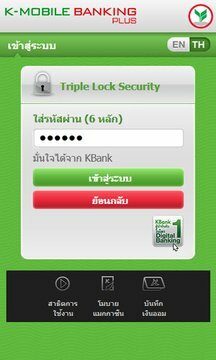 K-Mobile Banking can connected through only GPRS/EDGE/3G provided by the mentioned mobile network operators in Thailand. K-Mobile Banking will not be allowed to connect to KBank's server via WiFi. and description of the problem. so that we can inform your mobile network operator to correct their network configuration. For other problems please send report to info@kasikornbank.com providing your mobile phone number and date.